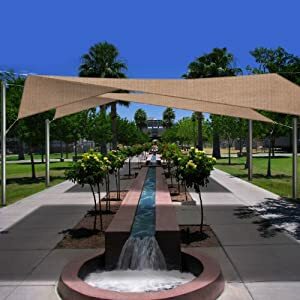 Phoenix Shade Sails are a great addition to your home, office, or wherever you could use a shade zone. Phoenix Shade Sails provide UV protection from the sun, a cool place for children to play, or an outdoor shaded area for entertaining guests. Set up in a permanent installation or use for portable shade. Each of our shade sails comes in two varieties: Home and Professional. The home sails have a lighter weight material and use galvanized 6mm hardware. These sails are lighter and easier to install and are available at a more economical price point. The professional sails use a heavier material and 8mm Stainless Steel hardware. If your area of intended use is subject to strong winds or significant precipitation, you may want to consider the professional option. All Phoenix Sun Sails come as complete kits including all necessary mounting hardware. The 18.5' square sail kit includes the 18.5' per side square sail, 2 turnbuckles, 2 carabiners, 4 pad eyes, 4 9' lengths of rope, and 16 wood screws. The sail has 4 triangle rings, one sewn into each corner, which resist twisting or movement compared to D-rings. All mounting hardware and triangle rings are made from 8mm stainless steel. The sail itself is constructed from a heavy duty 320g/m2 polyethylene weave material which resists mold and mildew and is easy to clean with simple soap and water. Unlike cloth or canvas materials, the polyethylene weave does not absorb water or humidity. This water resistance, together with built in UV protection, ensures Phoenix sun sails stand up to years of outdoor exposure.